Ecuador's national energy company says it is starting to recover some of its production, despite a continuing strike by oil workers in the Amazon. Troops used tear gas to dislodge some of the protesters from Petroecuador's oil fields and arrested at least one of their leaders. But strikers, who are demanding overdue wages, have decided to continue their protest, which started on Monday. The government has declared a state of emergency in three provinces. The eastern provinces of Napo, Orellana and Sucumbios have been placed under military control, and rights to freedom of movement have been suspended. The country's oil production accounts for nearly half of its annual budget. The government has offered to release some extra funding and to meet strike leaders. Thousands of workers walked out at Petroecuador's oil infrastructure and wells on Monday. Among other things, they are demanding to be employed directly by the company, rather than subcontractors. 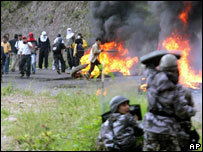 Petroecuador says the protest has damaged production in the oil-rich provinces. The company says it expects production to rise to 190,000 barrels per day (bpd) in the next few days, as troops gradually clear striking contract workers from its installations. It says it may hire replacement employees to bring operations back to normal levels - usually 200,000 bpd. It is the second time in recent weeks that the government has declared a state of emergency over oil protests.